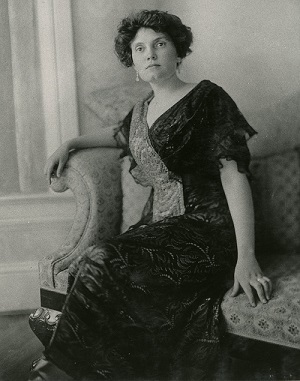 Oklahoma Connection | Gore came with her husband Senator Thomas P. Gore to Oklahoma in the early 1900s. As her husband, Senator Thomas Gore, was blind, Nina Gore became an expert in “seeing,” recognizing and identifying for him anyone with whom he might need to communicate. Born in Texas, Nina Kay Gore married her blind husband Thomas in 1900 when he was an attorney in Corsicana, Texas. The couple soon began her husband’s stellar political career and were quickly carried into the national spotlight. Not only did Mrs. Gore attend to her husband’s political needs, but also arranged her household so that the Senator could find whatever he wanted without assistance. She developed an astounding memory and sense of timing that enabled her to advise the Senator as to all who might be present in a room, even whether or not a person’s remarks were accompanied by the appearance of sincerity.